The back porch of the church building is complete. The structure will hold the air conditioner units for the building, serve as the platform for the elevated electrical meter and feed, as well as provide rear egress from the building. Men from Grace Covenant Baptist Church, Bermingham Alabama dug the footings, built the forms, set the rebar and prepared for the slab. 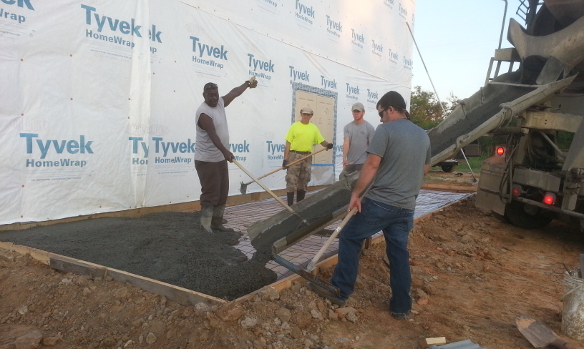 Local men and our church members poured and finished the concrete. 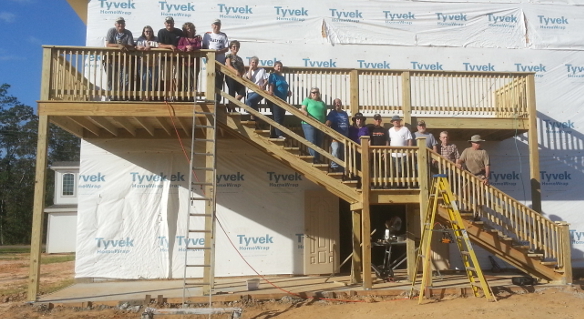 A great team from Pine Forest Baptist Church, Vidor, Texas built the deck and stairs. The project turned out very nice. One of the volunteers said, “Its a shame such a beautiful back porch has to hold ugly air conditioner units.” Someone else replied, “God deserves the very best.” Everyone agreed. So good to see the progress you and your faithful congregation are making!!! When this old gal was working part-time, I was able to make a contribution shortly after Katrina. My current $$$ situation is a tight one and I am not in a position to make a contribution. I am a 17 year Hospice volunteer and thoroughly enjoy being a part of our wonderful Suncoast Hospice, and this is where I try to be of some help. May you and all your loving congregation be blessed with good health and happy days in 2014.